When you start a cafeteria, one of the first things you have to do is decide is the type of food you will be cooking. This will determine the kind of equipment you will need to purchase. In some cases, you might already have equipment on the premises and you need to formulate a menu around what you have to work with. Whether you have the equipment already, or you need to buy it, you will need to consider the kind of food you want to serve in order to decide the type of equipment you will need. 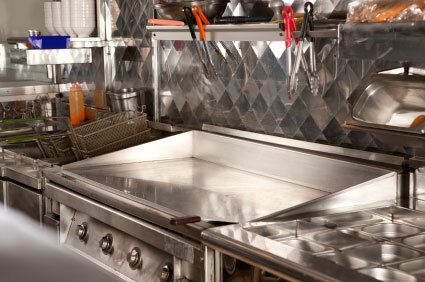 The countertop griddle is a highly useful piece of equipment. Whether you are planning to serve eggs, toasted sandwiches or burgers, this piece of equipment will help you to get the job done. A thick piece of steel maintains a constant temperature once it has warmed up, allowing you to cook many different foods at one time. It is an essential piece of equipment for any cafeteria that wants to prepare quick food items. Most cafeteria patrons appreciate having their food cooked up fresh, right in front of them. If you are looking to create stews or anything else that might start with a little searing and end with simmering, you will need a tilt skillet. A tilt skillet or braising pan, looks like a flat top griddle but has high straight sides on all four sides. It is also freestanding. You has easy to operate thermostatic controls that can be easily adjusted. Most models also come with a lid that can be opened or closed. When you are finished cooking, the hand crank or mechanical crank (depending on the model) allows you to pour out whatever you were cooking or give you better access to it. When you use a smoker, you can make any kind of barbecue food you want. Anything from ribs to pulled pork can be made using this type of equipment. Even if you are want to make smoked salmon for a breakfast menu, a smoker can get it done. Unlike a smokehouse, you will not need to stockpile wood, or create a lot of smoke to get the smoky flavor you are looking for. Just load the smoker with some wood chips, as directed and start smoking anything you want. The excess smoke will go right out the vents. If you are looking to make large quantities of soup for your cafeteria, you can use the steam kettle. This piece of equipment heats water to create steam that flows through the inner walls of the kettle. Shaped like a large saucepot, it is perfect for anything liquidy you might need to cook, including sauces and even some breakfast items or gravies. It is the perfect thing in which to make soup stocks. The kettle comes in various sizes and either tilts or has a large pour spout at the bottom. A commercialsteamer is a great way to cook healthy alternatives, like vegetables. Steamed broccoli will take just a few seconds when you pop it into a countertop steamer. Additionally, a steamer is a great way to reheat items that you have cooked in advance. Put the whole container with plastic wrap into the steamer and heat it until the inner temperature is over 140 degrees. This is a prefect piece of equipment for cafeterias that cater to a health conscious crowd, or a hospital that needs to provide healthy meals.